Ten consecutive strikes, all thrown backwards, in a game with a final score of 280. It's a world record! The bowler in the video above by RecordSetter is Andrew Cowen, from Rockford, Illinois. Isn't his form just fantastic? I barely have proper form when trying to bowl normally, heh. This was the first game I ever shot where I didn't turn to look at any of the shots (usually I turn my head immediately to watch the ball reaction). I kept my eyes focused up on the camera during each approach. I just tried to stay focused on my form, as I didn't know what the ball reaction was. I was quite emotional at the end. I did not actually see any of the shots in the game until I got home and watched the video. Any motioning I'm doing is based purely on how I "feel" the shot is is going to hit. 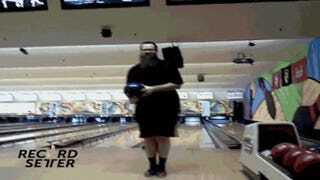 The previous world record for backwards bowling was 278, and it was held by Jim Cripps.